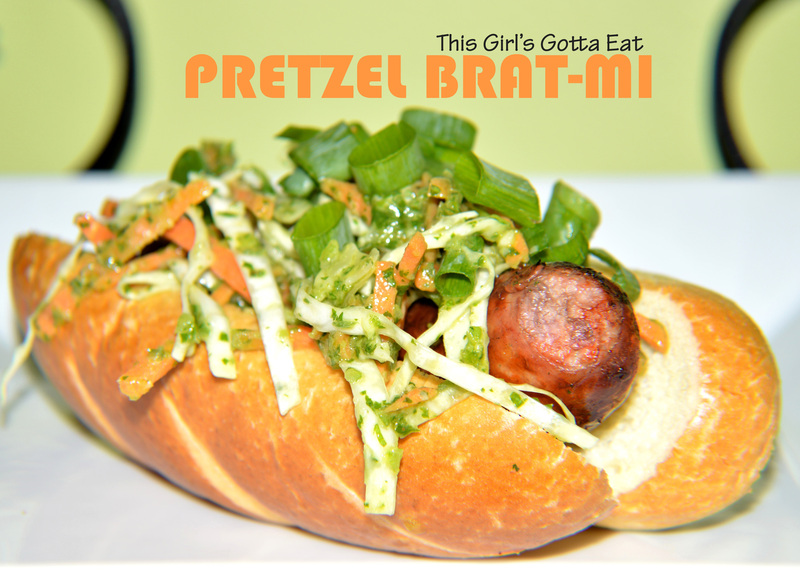 orlando baking company | This Girl’s Gotta Eat! The muffuletta sandwich is a New Orleans classic, made with a special round bread and Italian meats, cheese and an olive spread. 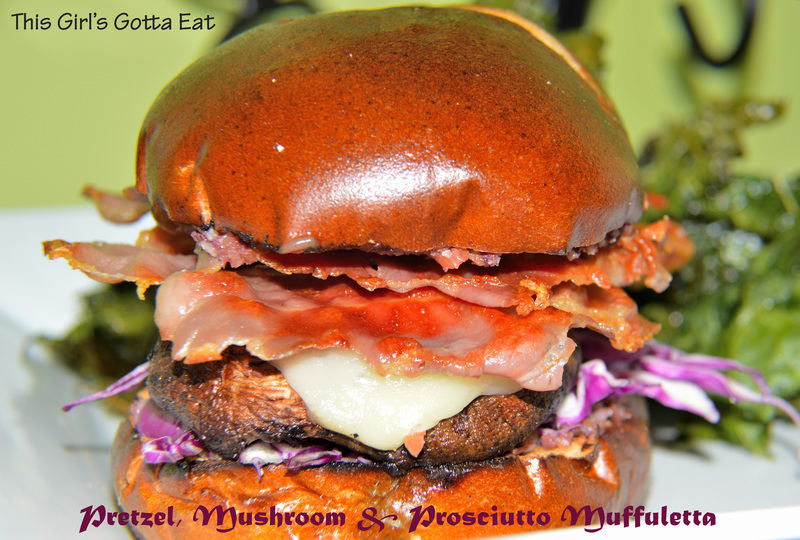 Here’s a unique and delicious spin on the classic, made with Orlando’s pretzel buns and grilled portobella mushrooms. If you prefer a slightly less salty bite (I happen to have a strong palate), or a meatless option, simply leave off the proscuitto. Add the olives, giardiniera and oregano to a small food processor and pulse until finely chopped and well combined. Transfer olive spread to a small bowl and add the olive oil and red pepper flakes. Mix to combine and store in the fridge for at least an hour. You can even make this spread the day before – just store covered in the fridge. Preheat grill to medium-high. Drizzle mushrooms with a little olive oil on both sides. Grill mushrooms uncovered, until grill marks appear and mushrooms are softened, about 2-3 minutes per side. Split the hamburger buns, place the inside part of the bun on the grill and toast, just a few minutes – be careful not to burn. Remove mushrooms and buns from the grill. Place sliced cheese on the mushrooms and tent with foil and rest a few minutes, allowing the cheese to melt. While the mushrooms are grilling, add the prosciutto to a small saute pan over medium heat and cook until browned and crisp on both sides. Remove to a paper towel-lined plate. To build the sandwiches, spread half the olive salad evenly among all four buns (the tops and the bottoms). Save the remaining olive salad for another sandwich, would be great the next day for lunch! Next, place some of the cabbage on the two bottom buns. Top each with two mushroom caps melted with cheese, slightly overlapping each other. Top each sandwich with two pieces of the crispy prosciutto (optional) and finish by adding the top bun with the olive salad. Secure with a toothpick if needed. 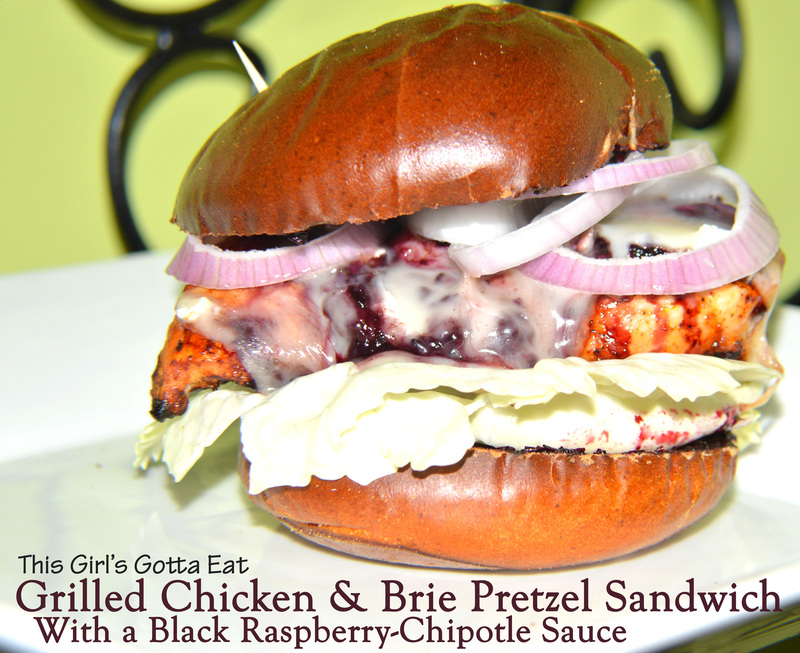 Here is another delicious, and super easy Orlando pretzel bun recipe. 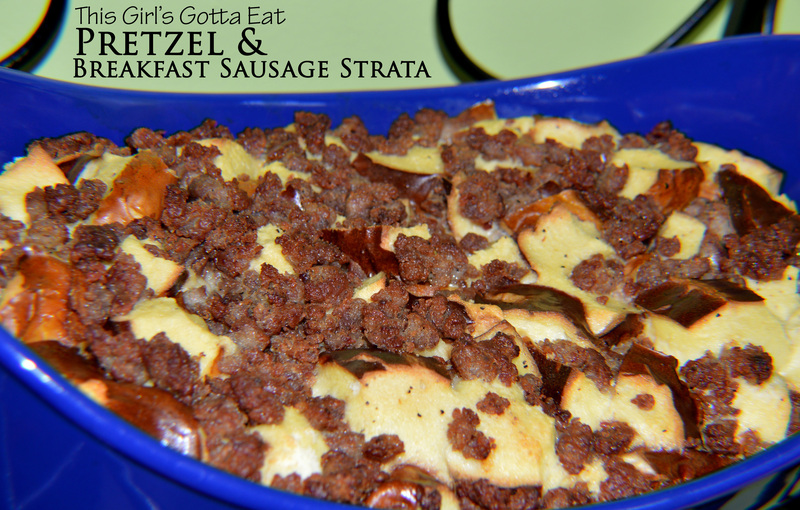 Serve Orlando pretzel hamburger and hot dog buns at your next cookout, then use the leftover buns the next morning for breakfast in this savory strata! These pretzel buns have between 7-9 grams of protein, making them a great addition to your breakfast or brunch menus. 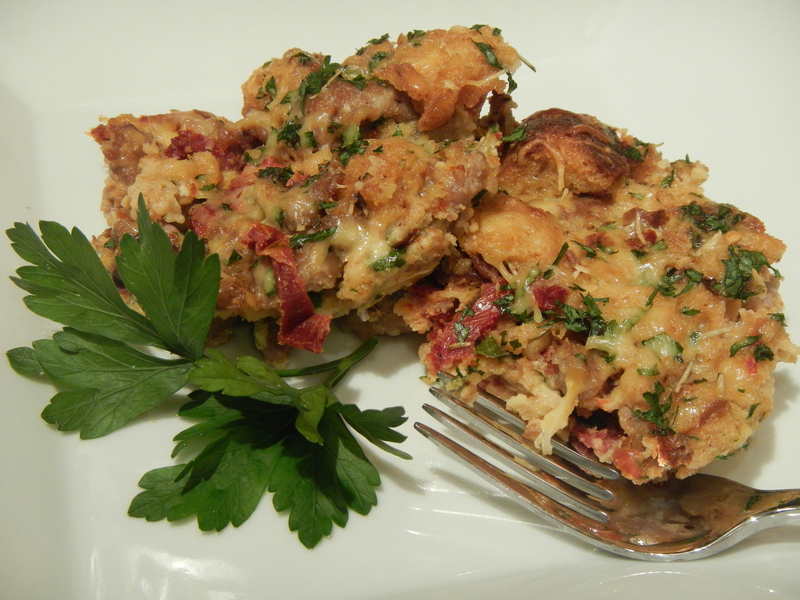 Strata is a baked egg and bread dish, often with meat and/or cheese, and resembles a bread budding of sorts. My Mom has made a rendition of this strata for years, my most recent memory is for the morning of my wedding. As I made this today, I couldn’t help but think of the house filled with the smell of homemade breakfast, as all the gals ran around getting ready! Thanks, Mom, for always making sure I have a delicious home cooked meal (even well into adulthood), and for the basis of this yummy recipe! I didn’t make this version with cheese, as I opted to top it with organic maple agave syrup instead, for the perfect salty and sweet bite. You could of course, top with a cheese of your choice before you bake instead. Heat a large non-stick skillet over medium heat. Add sausage and break up with a wooden spoon. If you’re using the breakfast patties, cube the meat up first to make it easier to break apart. Cook meat until browned and continue to crumble with the wooden spoon as it cooks. Transfer browned sausage to a paper-towel lined plate to soak up the grease. Meanwhile, spray a 9 x 13 pan with non-stick spray. Cube the pretzel buns and place evenly in the bottom of the pan. In a medium bowl, whisk the eggs, milk, Worcestershire and sprinkle of pepper. Do not season with salt, as the sausage will be salty enough. Once the sausage is cool enough to handle, sprinkle it evenly over the cubed bread and top everything with the egg mixture. Using your hands, gently press the bread down so that it’s all coated with the egg mixture. Bake 35-40 minutes, or until the eggs are set. Remove from the oven and let sit 5 minutes before serving. Slice into single servings and remove with a spatula. Top with a little maple syrup and enjoy. You can make this a day in advance and bake the morning you want to serve. Just prep it all and store covered in the fridge. Bring to room temp before baking, or, bake a little longer if you put it in the oven cold. 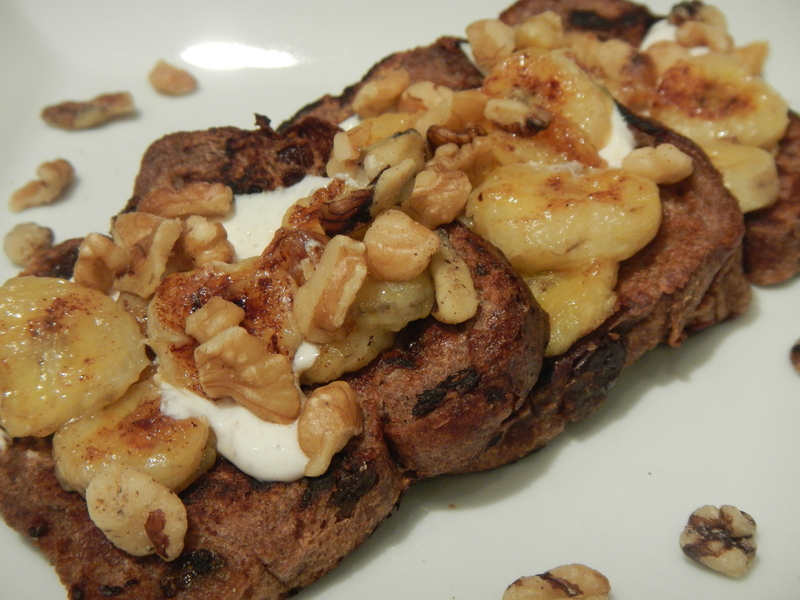 Last week I shared that Orlando Baking Company asked me to taste-test their True Grains, 100% whole grain bread and blog about what I thought (https://thisgirlsgottaeat.wordpress.com/2014/01/11/purple-wheat-raisin-bread-french-toast-with-yogurt-caramelized-bananas-and-nuts/). Next up in the sample package, their Honey Grain bread, hence this second installment of my taste-testing adventure. You may think of dessert when you hear bread pudding, but you can make it equally savory as you can sweet (think of it like stuffing). Because this Honey Grain bread is a bit on the sweeter side, I thought it would offset spicy sausage…winner! Usually bread pudding is made with a crusty loaf of bread or day-old bread, but you can easily turn any bread into a base for bread pudding by simply leaving it out uncovered overnight, or toasting it in the oven. 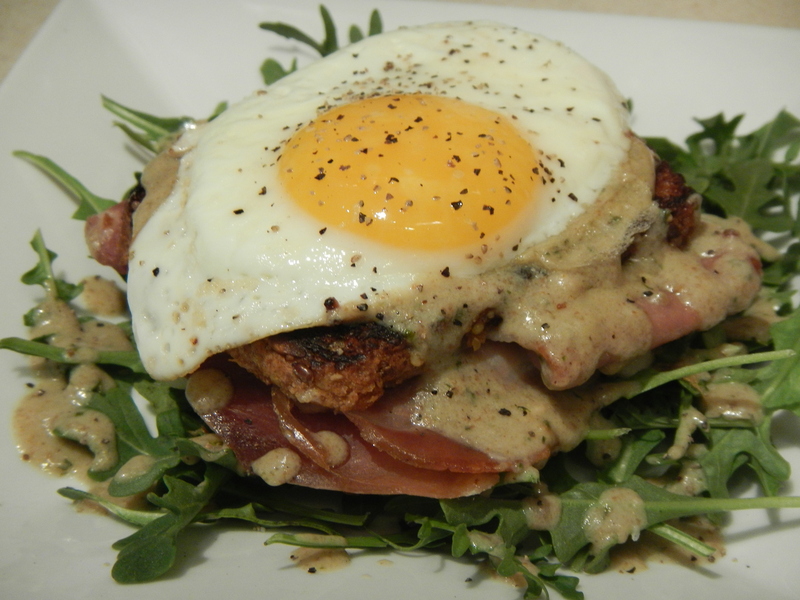 The benefit to using bread like the Honey Grain in a dish like this, is for its nutritional value. Honey Grain is 100% whole grain containing OMEGA 3, which is an essential nutrient that promotes cardiovascular health. Cook the sausage in a small frying pan over medium heat, stirring frequently, until slightly browned and cooked. Remove from heat and set aside. In a large bowl, mix together the eggs, milk, rosemary, salt, red pepper flakes and 1 Tbsp of the fresh parsley. Add the bread, garlic, cooked sausage, sun-dried tomatoes, cheddar, and 3/4 cup of the gouda. Mix and allow to sit, 5 – 30 minutes depending how much time you have, or until the bread is soft and wet. Spray a 9 x 13-inch rectangular or 10-inch circular casserole dish with non-stick spray and pour the mixture in. Sprinkle the top with the remaining fresh parsley and gouda. Bake for 30 minutes or until golden brown. Remove from the oven and allow to cool for 10 – 15 minutes before serving. You could also make this bread pudding as a side dish. If making ahead of time, in the morning for instance…just keep it covered in the fridge until you’re ready to bake.